Hangzhou Enterprise Executives visited ZCCA on Nov. 18th, 2013. This visiting group has been to the U.S. several times before and was very interested in investment immigration, opening up American market, and education. Dingkang Yao, the General Counsel of ZCCA, explained the problems that the group had. He pointed out that a brand is the key to open up the market. Creating, purchasing, and surrogating a brand are all possible ways to do. During the process of investment immigration, it is better to find some successful and credible Chinese companies to cooperate to reduce the risk of investment. Then, Xiaoping Zhou, the president of ZCCA, suggested that international students should do branding in the U.S., so that they can receive their green cards as soon as possible. International students would better to stay in China for one year to reduce suspect of immigration and know more about the Chinese market and business as well. Zhongfang Dai, the president of ZCCA, strongly hoped to bring American products to the Chinese market. He suggested that he has close contacts with many American political organizations that are willing to help on this issue. 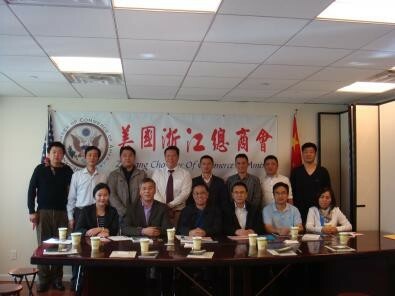 Cooperation between American political organizations and Hangzhou enterprise executives are very possible in the future.